The XJLink2-CFM is an advanced multi-TAP JTAG controller that fits into one of four Custom Function Module (CFM) locations on a Teradyne Multi-Function Application Board. It offers convenient, integrated access to XJTAG’s powerful test and programming tools from Teradyne’s TestStation™ In-Circuit Test Systems. The XJTAG XJLink2-CFM adds the power of XJTAG’s boundary scan solution to the Teradyne TestStation, giving test access to hard-to-probe parts of a board. Both JTAG and non JTAG devices, such as Flash, RAM, Ethernet controllers, SPI, and I²C devices can be tested without physical probe access, reducing probe count and fixture cost, while increasing the test coverage. In addition to testing, memory devices, FPGAs and CPLDs can be programmed. 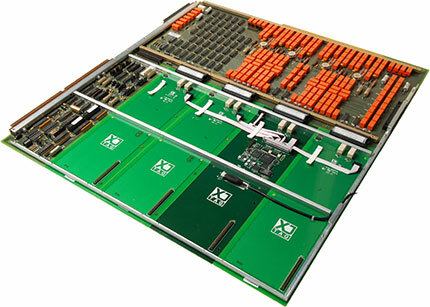 A single or multiple XJLink2-CFM controllers can be added to the same Teradyne Multi-Function Application Board for supplementary test and program capabilities, for instance testing panels of boards. 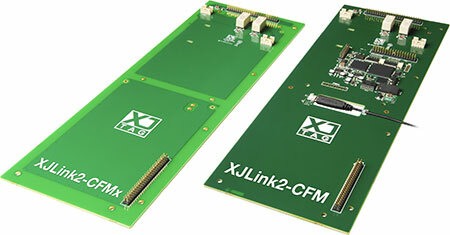 The XJLink2-CFMx expander card is available to maximize available connectivity from an XJLink2-CFM controller, from a maximum of 8 fixture-connectable signals when just using the XJLink2-CFM, up to 18 signals by adding one, two or three XJLink2-CFMx cards. The interface of XJLink2-CFM is completely configurable and can be used for more than JTAG: I²C, SPI and other manufacturer-specific protocols can be driven as part of test and programming operations. Programming speeds close to the theoretical maximum of a device can be achieved using the advanced features of the XJLink2-CFM. The combined system can realize the maximum potential of your test investment. For example, by using boundary scan access to configure and enable an analog output from the board and then use the ICT to measure and validate the output. The XJLink2-CFM is fully compatible with other types of XJLink2 controller from XJTAG, so identical tests can be run in the TestStation as on another unit on a test bench. This allows boundary scan tests to be developed and debugged without taking up time on the tester. The XJLink2-CFM’s capability to combine test and programming allows a reduction in the number of stages and handling operations on a production line. The XJLink2-CFM has variable signal slew rate and drive strength so it can handle boards either with or without signal termination. Advanced auto-skew control enables use of the JTAG chain at the maximum frequency, while the configurable voltage levels allow direct connection to most JTAG chains. The XJLink2-CFM can contain an XJTAG software license, for stand-alone operation without additional dongles or network access — or the system can be licensed from a network server for maximum use of your XJTAG products without moving licensed hardware between machines.